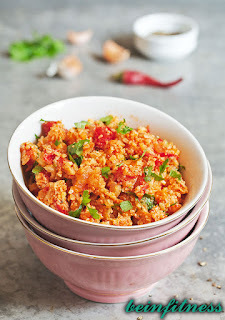 Home / Lunch / Recipes / Mexican Cauliflower "Rice"
This is a classic dish in Mexico ,if you cook a Mexican Cauliflower dish a side of Mexican rice is just the thing to complete the meal. I’ve adjusted the traditional recipe to accommodate the Paleo lifestyle, with rice being replaced by cauliflower. 1.cut cauliflower and red pepper into chunks and place in a food processor or mixer. Stir until the pieces are the size and consistency of the rice. 2.Transfer "rice" in a medium bowl. Top with remaining ingredients and sprinkle with cumin, cinnamon, red pepper, salt and pepper.